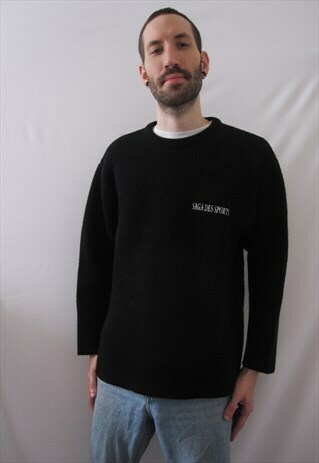 Vintage Mi-Temps cute black sweater with embroidered "Saga des sports" text on the front and New Zealand silver fern artwork on the back. Measurements: length from shoulders - 62cm / width armpit to armpit - 50cm / sleeves - 55cm / Model is 6ft/1.80m tall and normally wears a size M. Please note that all of our items are vintage and may show signs of wear and age. Any obvious flaws will be mentioned in the listing.